Professor of Biology Piali Sengupta gave the 2015 Stetten Lecture at NIGMS on Oct 21 on Form Meets Function: Structurally Diverse Cilia and Their Roles in Sensory Signaling. The “cilia squad” in the Sengupta Lab has been working for some years now to examine cilia formation in sensory neurons in the nematode C. elegans, and the relationship between the structure and nerve cell function. You can watch Piali’s lecture online. In a new paper in eLIFE, a team spearheaded by Brandeis postdocs David Doroquez and Cristina Berciu provide a strikingly detailed look at key structures called cilia on neurons involved in sensory perception in the nematode C. elegans. Primary cilia are the antenna-like structures onsensory neurons that gather information about the animal’s environment, such as chemicals, temperature, humidity, and touch. 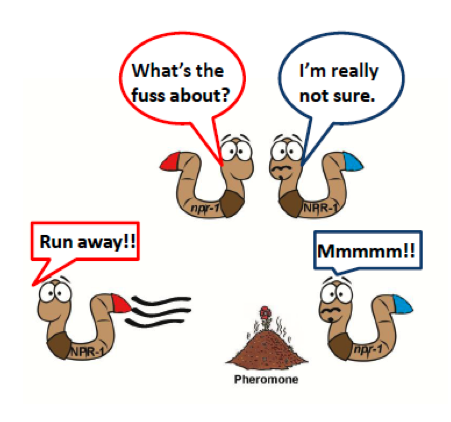 The genetic tools available to manipulate individual, identifiable neurons in C. elegans make worms an excellent model organism to study the assembly and function of cilia. 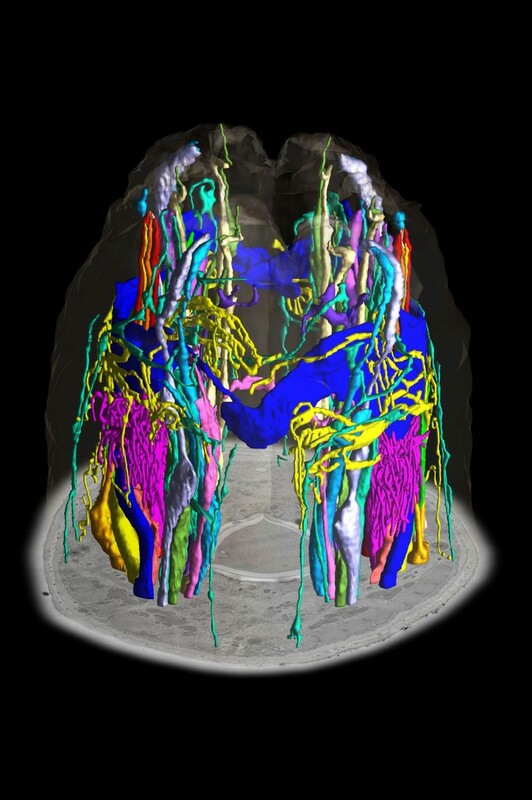 This study requires a description of the structure of the cilia and their immediate surrounding glial support cells, and this new paper, a collaboration of the Sengupta and Nicastro labs, provides high-resolution 3D models showing how diverse and specialized these structures are. and other neuronal projections in the head of the soil roundworm C.
transmission electron microscopic cross-section of the worm. The key techniques in this study were serial section transmission electron microscopy and electron tomography, with structures well-preserved by high-pressure freezing and freeze-substitution. 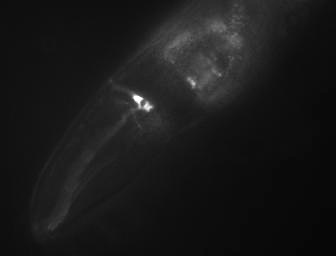 With these techniques, the authors achieved the first high-resolution 3D reconstructions of 50/60 cilia from C. elegans. They describe several previously uncharacterized features — for example, there are distinct types of branching patterns – in one, the two cilia originate from independent basal bodies (as previously seen in Chlamydomonas). In the second, the cilia branch after the basal transition zone, the ciliary gatekeeper region. 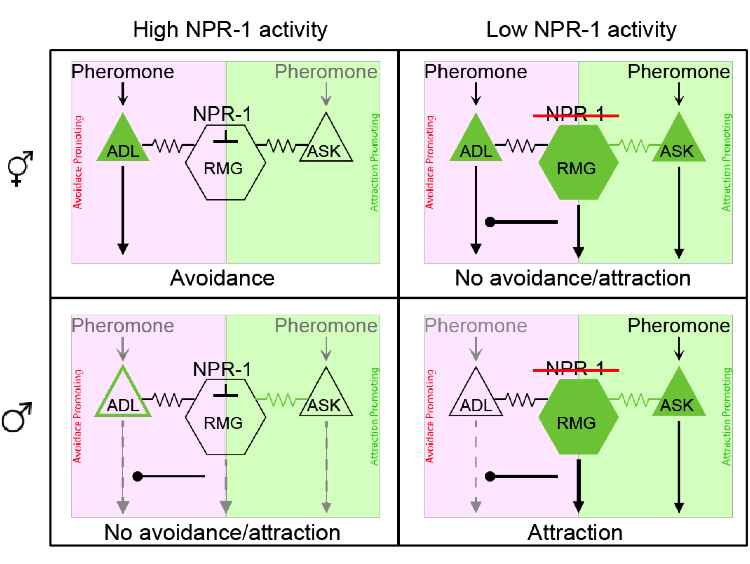 In the latter case, this basically means that whatever is needed for the cilia to branch has to be transported through the transition zone, suggest there might be novel mechanisms of ciliary protein trafficking. In a third pattern, the branching occurs proximally before the transition zone, and represent therefore dendritic microvilli, rather than ciliary branching. The study also showed different organizations of microtubules in different cilia types and vesicles in regions of the cilia which have never been seen before, again pointing to new mechanisms of protein transport. They also describe new cilia-glial interactions, which might suggest that cilia and glia talk to each other. Doroquez DB, Berciu C, Anderson JR, Sengupta P, Nicastro D. A high-resolution morphological and ultrastructural map of anterior sensory cilia and glia in Caenorhabditis elegans. eLife. 2014;3(0):e01948-e.
We’ve all been busy this spring writing grants and teaching courses and doing research and graduating(! ), so lots of publications snuck by that we didn’t comment on. Here’s a few I think that might be interesting to our readers. Tsai MF, Miller C. Substrate selectivity in arginine-dependent acid resistance in enteric bacteria. Proc Natl Acad Sci U S A. 2013;110(15):5893-7. Tsai MF, McCarthy P, Miller C. Substrate selectivity in glutamate-dependent acid resistance in enteric bacteria. Proc Natl Acad Sci U S A. 2013;110(15):5898-902. 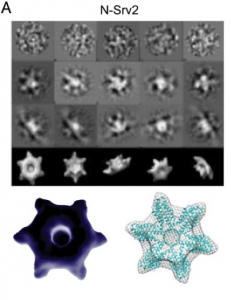 Are ninja stars responsible for controlling actin disassembly? Seems like the Goode lab might think so. Chaudhry F, Breitsprecher D, Little K, Sharov G, Sokolova O, Goode BL. Srv2/cyclase-associated protein forms hexameric shurikens that directly catalyze actin filament severing by cofilin. Mol Biol Cell. 2013;24(1):31-41. What do you get from statistical mechanics of self-propelled particles? The Hagan and Baskaran groups team up to find out. Redner GS, Hagan MF, Baskaran A. Structure and dynamics of a phase-separating active colloidal fluid. Phys Rev Lett. 2013;110(5):055701. Lisman JE, Jensen O. The theta-gamma neural code. Neuron. 2013;77(6):1002-16. Pennington KL, Marr SK, Chirn GW, Marr MT, 2nd. Holo-TFIID controls the magnitude of a transcription burst and fine-tuning of transcription. Proc Natl Acad Sci U S A. 2013;110(19):7678-83. Hall SE, Chirn GW, Lau NC, Sengupta P. RNAi pathways contribute to developmental history-dependent phenotypic plasticity in C. elegans. RNA. 2013;19(3):306-19. Can nanofibers selectively disrupt cancer cell types? Early results from Bing Xu‘s group. Kuang Y, Xu B. Disruption of the Dynamics of Microtubules and Selective Inhibition of Glioblastoma Cells by Nanofibers of Small Hydrophobic Molecules. Angew Chem Int Ed Engl. 2013.